After 30 days, get another every month for only $12.99 AUD. Cancel any time. A fiftieth-anniversary edition of Ken Kesey's searing American classic. 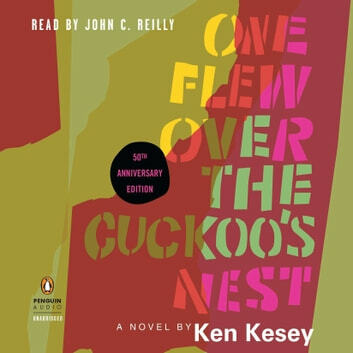 Boisterous, ribald, and ultimately shattering, Ken Kesey's One Flew Over the Cuckoo's Nest has left an indelible mark on the literature of our time. Turning conventional notions of sanity and insanity on their heads, the novel tells the unforgettable story of a mental ward and its inhabitants, especially tyrannical Big Nurse Ratched and Randle Patrick McMurphy, the brawling, fun-loving new inmate who resolves to oppose her. We see the story through the eyes of Chief Bromden, the seemingly mute half-Indian patient who witnesses and understands McMurphy's heroic attempt to do battle with the powers that keep them all imprisoned. Hailed upon its publication as "a glittering parable of good and evil" (The New York Times Book Review) and "a roar of protest against middlebrow society's Rules and the invisible Rulers who enforce them" (Time), Kesey's powerful book went on to sell millions of copies and remains as bracing and insightful today as when it was first released. This new deluxe hardcover edition commemorates the fiftieth anniversary of the original publication of the novel on February 1, 1962, and will be a must have for any literature lover.